Yetna being able to play or not playing is everything this game. Changes a lot for USF if he can't play or play all out like he does so well. 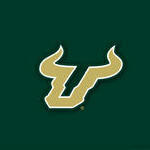 Looks like we will have to follow the game on radio (or USF app) as ESPNU game is in OT. Collins is going to have to be aggressive when McBuckets is on him. Get him in foul trouble.